The Santa Fe remains one of the top-selling SUVs in the country. The vehicle is stylish and more than capable of handling a variety of driving needs. Yet, the 2019 models are safer thanks to technological upgrades. Learn about the features in more detail by visiting our Ardmore showroom. 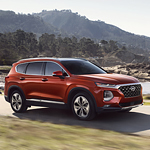 A camera positioned to the rear of the vehicle prevents collisions with obstacles that might cross the Santa Fe's path while backing the SUV. Blind spot sensors alert drivers when vehicles hover alongside out of sight. Special sensors monitor the movements of rear seat drivers. An alert recommends that drivers check the rear seat occupants before departing the vehicle. If passengers remain in the rear seats without a driver, the doors automatically lock and the horn sounds in addition to an alert sent to the driver's mobile phone. The unique system is designed to prevent youngsters or pets from being accidentally left behind.